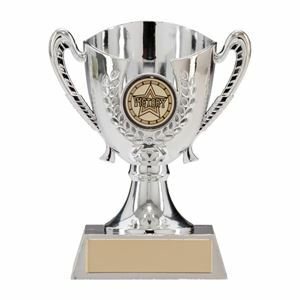 At Impact Trophies & Medals, we offer a huge range of cheap trophy cups suited to any sports or social club event or competition. 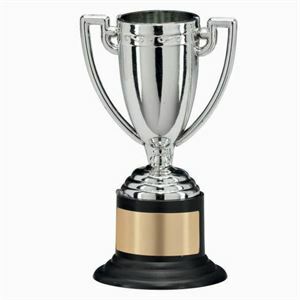 Our extensive range includes modern trophy cups, silver trophy cups and star cut trophy cups. Impact Trophies & Medals are a leading retailer of cheap trophy cups. 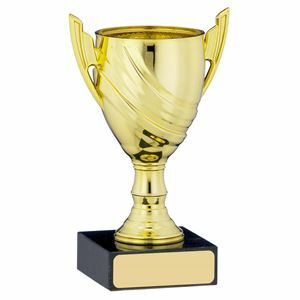 Great for personalisation, many of our great value plastic trophy cups and contemporary cups can be personalised with a free high quality text engraved self adhesive plate and printed logo inserts, to perfectly meet all your presentation needs. 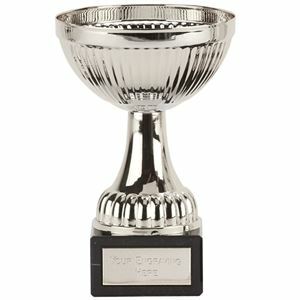 This mini trophy offers excellent value and is perfect for any occasion. The Goliath Mini Plastic Cup is made from polished quality plastic and is mounted on a round black base. The trophy can be supplied with a FREE separate personalised self adhesive printed express plate displaying your text details and ready to be applied. This glossy plastic cup is available in three metallic colours - gold, silver and bronze and would make an ideal award for presenting at large scale prize giving ceremonies. The Jubilation Football Cone forms part of our bulk buy range and offers exceptional value for money. 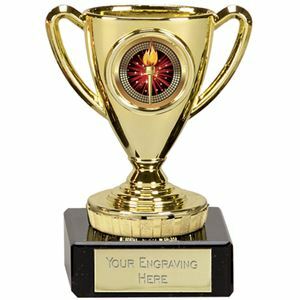 Available to purchase in a minimum quantity of 24, these quality awards come mounted on a marble base with room for an engraved plate, personalised for each member of your team. 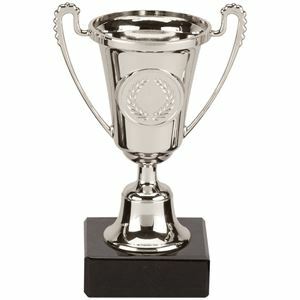 Offered at an excellent entry level price, the Feat Plastic Cup is a traditional trophy cup with decorative gentle embossed ribbing diagonally across the cup which leads neatly from the handle. The cup is mounted on a solid black marble base which takes a FREE personalised plate. The Serenity Silver Plastic Cup is made from gleaming silver plastic mounted on a small riser and plinth. The round cup features a laurel wreath imprint and decorative handles.